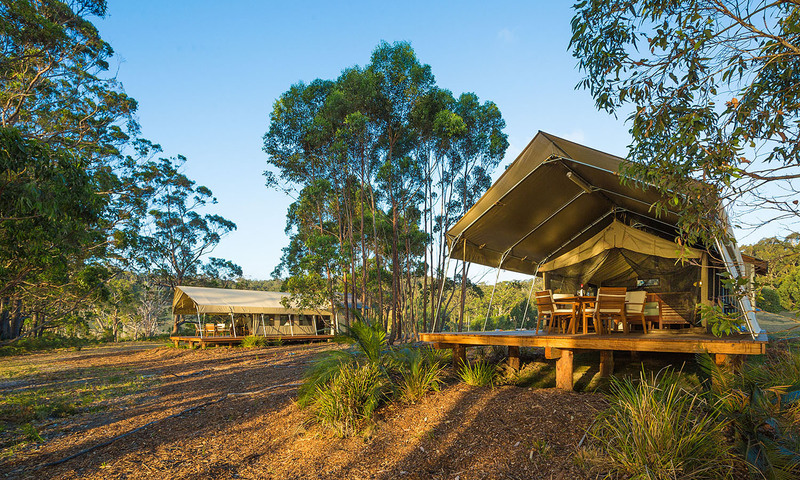 Set on the edge of a coastal lagoon on the doorstep of Mimosa Rocks National Park, just north of Tathra on the New South Wales coast, Tanja Lagoon Camp offers offers accommodation integrated with nature. Formerly a dairy farm and saw mill, the property is undergoing a transformation as the owners return the land to its original state. The three safari tents have private bathrooms, queen-size beds, writing desks and timber decks built with locally milled wood. Kangaroos graze on the grass, spoonbills lurk about the dam and there is plenty of other wildlife to keep guests entertained. During the day, you can relax and watch the rosellas from your deck or take a canoe out across the water. More active visitors can hike along the edge of the lagoon to Middle Beach’s surf breaks to spot migrating whales. Your booking includes a light breakfast and use of the canoes.